As Lake Mary pest control specialists since 1996 and Servicing Central Florida for over 20 years, Enviro Tech Pest Prevention Systems's team of professional pest control specialists has toiled to meet the growing demand in pest control services, both from residential and commercial clients. Enviro Tech Pest Prevention Systems is proud to have grown into the premiere pest control company in and around Lake Mary, FL. 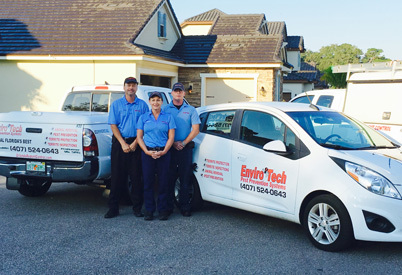 At Enviro Tech Pest Prevention Systems, our pest control specialists understand how unsettling and unnerving the discovery of a pest infestation issue can be. No one wants to face the grim reality of having rats, cockroaches or termites running around inside their walls, professional kitchen or, for that matter, anywhere they consider home or work. Ignoring the problem will not make it go away, and this is why Enviro Tech Pest Prevention Systems's Lake Mary pest control specialists are dedicated to offering as much information about pests as possible, so that you know what you are up against and can relax, knowing that our pest control specialists from Enviro Tech Pest Prevention Systems have a solution to your unfortunate pest control problem. Enviro Tech's goal is to offer you the most advanced pest control techniques at the lowest possible price, while always being aware of our customer's safety and the security of our environment. Termite services include: Wood Destroying Organism reports, Termidor/Premise treatments, Sentricon bait installation, wood repair, and re-treatment guarantees. Our odorless treatment means you and your family can remain comfortably inside the home during and after treatment. You don't even have to clear your cabinets. © 2010 Enviro Tech Pest Prevention Systems. All Rights Reserved. All information provided is provided for information purposes only and does not constitute a legal contract between Enviro Tech Pest Prevention Systems and any person or entity unless otherwise specified. Information is subject to change without prior notice. Although every reasonable effort is made to present current and accurate information, Enviro Tech Pest Prevention Systems make no guarantees of any kind.